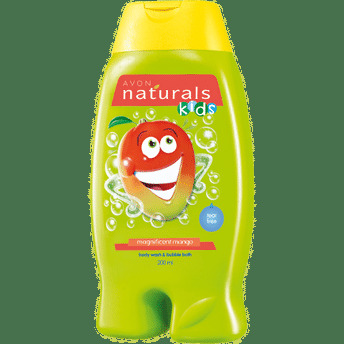 Tear free bathing for kids in a refreshing scent of mango with Avon Naturals Kids Magnificient Mango Bathing products. A mild & gentle body wash and bubble bath which is tear free, dermatologist tested and cleanses skin without overdrying.It provides rich luxurious bubbles and won't leave a tub ring. Leaves a fruity-fresh scent kids will love. Won’t leave a tub ring, provides rich bubbles. Additional Information: Avon is a leading global beauty company with a wide product line that includes cosmetics, skincare, fragrance, personal care and hair products along with being a global beauty icon and world leader in lipsticks, fragrances and anti-aging skin care and makeup products.